It may be hard to believe, but the attic of a typical house plays a major role in the building’s overall energy performance. That’s because most attics have too many air leaks and too little insulation. Understanding what goes on in the attic will help you appreciate what an experienced professional crew can accomplish to improve energy performance, comfort, and savings, while also making your house healthier and more eco-friendly. Limit attic air leakage to minimize the Stack Effect. In a typical house, more exfiltration (interior air leaking outside) occurs through the attic than anywhere else. This happens because warm air rises naturally by convection, and because there are many pathways for air exfiltration –from small openings around electrical outlet boxes to large gaps around chimneys, vent pipes and ductwork. When warm interior air leaks out through the top of the house, a similar volume of outside air needs to leak in, to avoid causing a vacuum. 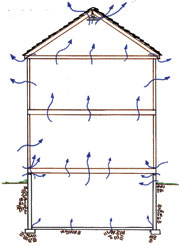 Exfiltration through the attic, combined with infiltration through lower parts of the house is called the Stack Effect, and it’s a major factor in poor energy performance. By creating a more effective attic air barrier, we can minimize the stack effect and start saving energy on heating and cooling. Attic air sealing: a must-do upgrade before adding insulation. Spray foam seals a plumbing penetration. Holes made in walls for plumbing, vents and electrical wires all provide air leakage pathways. Energy technicians typically seal these leaks with spray foam. It’s a common misconception that adding more attic insulation stops air leaks. The truth is that “fluffy” insulation like fiberglass and cellulose filters air; it doesn’t block it. For proof, you don’t need to look any farther than the air filter on your furnace or air handler. It’s made of fiberglass, just like fiberglass insulation. To effectively air-seal your attic, energy technicians need to move aside existing attic insulation and expose the wall framing, recessed lights, soffits, vent fans and other details; then they seal all the holes, gaps and cracks they can find. They’ll also seal around the attic stair or hatch and around chimneys and chases for ducts, plumbing and wiring. When a blower door test is performed after upgrading the attic air barrier, there will be a dramatic reduction in air leakage. With this energy upgrade complete, you can now upgrade your attic insulation in Connecticut. The U.S. Dept. of Energy recommends at least R-49 attic insulation levels in northeastern states. 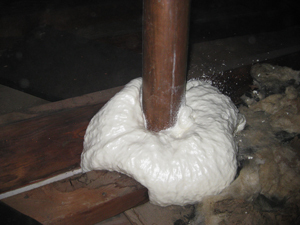 Many homes have just R-19 attic insulation. How much insulation do you have in your attic? If there’s just a single layer of fiberglass batt insulation, you can be sure your house is costing much more to heat and cool than necessary. Do the right thing for your family’s comfort and financial security and schedule an attic insulation inspection with an experienced home insulation contractor.